With its latest update, Asus raises the bar for Android tablet performance and design. Once again, Asus delivers a complete package with its Asus Transformer Pad Infinity TF700 Android tablet. The long-awaited Infinity maintains the slim, stylish, multipurpose tradition of its predecessor, the Asus Transformer Prime, while bringing an improved Nvidia Tegra 3 processor and a 1920-by-1200-pixel display along for the ride. This tablet blasts ahead of the pack to establish itself as the best-performing Android tablet we've seen to date, on all of our metrics except battery life. The 32GB version of the Infinity also offers double the memory of the third-generation 16GB Apple iPad, at the same price, $499. Meanwhile, the 64GB version of the Infinity costs $599, which is $100 less than the 64GB iPad. Asus expects the Infinity to be available for sale, at the earliest, during the week of July 16, in two colors: Amethyst Gray and Champagne Gold. On the outside, the Infinity is a virtual twin of the Prime: At 10.4 by 7.1 by 0.3 inches and 1.31 pounds, it measures a mere 0.08 inch (0.2mm) thicker, and weighs just 0.03 pound (12g) more than the Prime. That makes the Infinity one of the lightest and slimmest Android tablets on the market today. By comparison, Apple's iPad measures 9.5 by 7.3 by 0.4 inches, and weighs 1.44 pounds. The extra 0.12 pound makes a bigger difference than you might expect, both for casual use and for long-term use. I found the Infinity more comfortable to hold, especially when I held it in one hand instead of two. Our test images looked great on the Infinity, too. As expected, images generally looked sharper and clearer, and had better color reproduction than on such 1280-by-800-pixel tablets as the Asus Transformer Pad TF300, the Asus Transformer Prime, the Toshiba Excite 10.1, and the Samsung Galaxy Tab 2. At maximum brightness, images viewed on the Prime looked more washed out than corresponding images on the Infinity--even though the Infinity's Super IPS+ display has the stronger maximum brightness measurement at 630 candelas per square meter to the Prime's 564 cd/m2. The Infinity's images were similar in sharpness to the iPad's, though both the iPad and the Iconia Tab A700 had an ever-so-slight edge in that regard; also, the Infinity's images looked overly bright--likely a consequence of the brighter display (iPad's display maxes out at 445 cd/m2). Dialing down the brightness helped a bit, but both the Acer A700 and the iPad outpointed the Infinity in color and skin-tone reproduction and saturation. That said, the Infinity clearly topped its predecessor, the Prime; the Prime's images lacked the contrast and clarity of those on the Infinity. We tested a shipping version of the tablet supplied by Asus, but the company said that it would have an over-the-air firmware update available at around the time of retail launch, providing Hulu certification and other optimizations. The Infinity comes loaded with Android 4.03 Ice Cream Sandwich, 1GB of DDR3 memory operating at 1600MHz (an improvement over the type of memory used on the Prime), and a quad-core 1.6GHz Nvidia Tegra 3 T33 processor. When in single-core operation, the new Tegra operates at 1.7GHz. By comparison, the Prime's Tegra 3 processor operates at 1.3GHz for two to four cores and at 1.4GHz when a single core is in use; for its part, the processor in the Acer Iconia Tab A700 runs at 1.3GHz/1.2GHz. Among Android tablets, the Infinity roared past almost all comers on our suite of tablet tests. It outperformed other Tegra 3-based models running at a slower clock speed (and with slower system memory) to grab the crown as our top scorer on Geekbench and AndEBench, and it posted the best frame rates on our two GLBenchmark tests (Egypt Offscreen and Pro Offscreen). It also delivered 2.9 frames per second, matching the Toshiba Excite 7.7's frame rate, on WebVizBench. The high-resolution display saps battery life faster, and that drawback is visible in the Infinity's battery performance. On our updated battery life tests, the Infinity lasted 7 hours, 58 minutes, versus the Prime's 8 hours, 22 minutes and the iPad's 10 hours, 46 minutes. But it was super-fast at recharging, requiring just 2 hours, 32 minutes to juice up. Elsewhere, Asus has made a few other evolutionary improvements. Like the Prime, the Infinity has a rear 8-megapixel camera, but now the camera has a slightly wider aperture for low-light shooting--f2.2 instead of the Prime's f2.4. Asus updated the camera software, too, as well as the sensor and flash; but in my casual shooting the benefits of these enhancements were minor in low-light and daylight shooting. In side-by-side comparisons, I preferred the images captured by the Infinity; the color and clarity was simply better than the Prime. (Another note: The high-res display made it easier to capture images, too.) The front-facing camera has been updated from 1.2 megapixels to 2 megapixels, so you can now obtain high-definition video chat. The Infinity also bumps up the Bluetooth support to Bluetooth 3.0. Ports remain the same as on the Prime: a Micro-HDMI output, a MicroSD card reader, and a proprietary connector to use with the charger/USB transfer cable or the optional keyboard dock. Like the other models in Asus's Transformer line, the Infinity morphs into a clamshell-style netbook when you snap the tablet into its $150 Mobile Dock; it uses the same dock as the Prime. Asus retains some of its now-standard Android customization features, including a custom keyboard that includes white keys with black text and a number row, and a control panel for quick access to the tablet's power settings, display controls, Wi-Fi and Bluetooth toggles, rotation lock, and other settings. Preloaded apps include Polaris Office, SuperNote, App Backup, App Locker, Asus Sync, MyNet (for streaming 1080p content across a network), and Asus Webstorage (with 8GB of free storage space for the "lifetime" of the unit, up from the Prime's one-year of free unlimited storage followed by paid storage). As with the Retina-display Apple iPad, your experience with how apps look will vary. Apps that have been optimized for the high-resolution display can look great, while those that lack higher-resolution assets may be a pixelated mess. Case in point: Riptide GP looks great on the Prime but looks garbled and outdated on the Infinity. Other apps, including Amazon's Kindle app, looked good. Sadly, I did encounter some odd behavior while transferring media to the Infinity from my Windows 7 PC. For example, I got error messages on the PC that the device was in use when I queued up more than one folder transfer; that alone is not entirely unusual among tablets, but then I received follow up error messages that aborted the copy. I also had several apps, including the browser and the camera, close unexpectedly; hopeful these glitches are ones that Asus will clean up with its first over-the-air update. 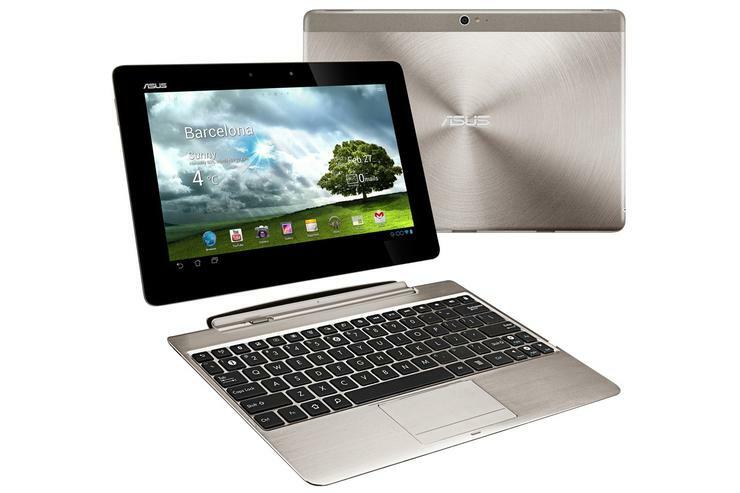 The Asus Transformer Pad Infinity TF700 takes over from its predecessor as the top Android tablet available. You get high performance mixed with high style, and you don't have to make a lot of sacrifices to get both. Other tablets--including the Prime, which is expected to drop in price once this model gets into the market--may provide better value, but no other Android tablet will give you the full package that the Infinity does.